Our organization receives wonderful appreciation notes from recipients, family members, professionals and card makers who are grateful for the work we have done. We would like to convey with you some of the kind words that people have been generous in sharing. "Thank you for the beautiful card and Bundles of Cheer. It put a huge smile on my face. I especially love the handmade pillowcase. I use it for my daily naps and it makes me smile every time I look at it. Thank you so much for brightening my day!" "The cards my daughter received while in the hospital brought a smile to her face, at a time when she could barely make a smile. It meant so much to me to see her smile at that point in her recovery. Thank you all so much." " Thanks a million for the beautiful card it meant a lot for your love and support in this time of my failing health. Please keep me in your prayers"
"Thank you for my Bundles of Cheer, what a nice unexpected surprise. It was very sweet and it cheered me up. Thank you for caring." "All of your card makers are amazing. I can't wait to see what creativity arrives in my box next. Keep up the beautiful and heartwarming work." "Thank you so much for the card. It was comforting, inspirational and really made my day." "I received a card from Card Care Connection today. The card made my day in a way no one will ever understand. I look forward to receiving more cards throughout my battle." "I received a handmade card from you today and the message inside was simply beautiful. Thank you from the bottom of my heart!!" "I want to say thank you for the beautiful handmade card. This is so appreciated beyond words. What a nice thing you do for people you have never met. God bless everyone that takes the time to volunteer for this program. I am doing great thanks to the support and love from people like you." "Thank you so much for your kind thoughts and word of encouragement. I appreciate your time and effort to do this for me." "We appreciated the beautiful handmade card for our mother in her final days." "The beautiful card came at such a great time. She received chemo this week and was having a rough time. 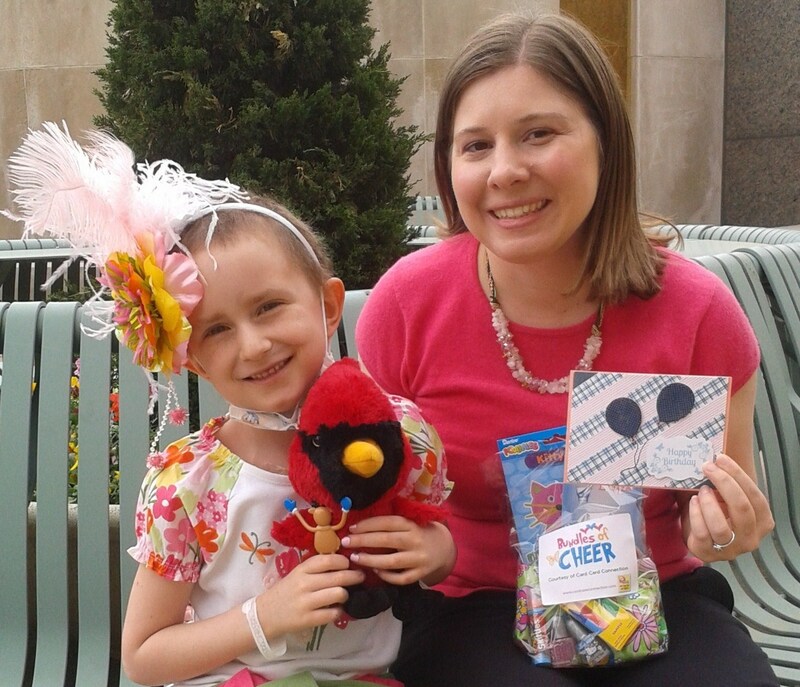 Thank you, your program helped to brighten her day." "I recently received a card from your program. Thank you. What a lovely effort you created! "What a wonderful, beautiful blessing! I love my card and it came at the right moment. Your kind and caring note helped me get through yet another round of chemotherapy. I am looking forward to receiving more cards in the future." "Thank you for the beautiful card and the wonderful words you sent me. The card came on a day that I was feeling very depressed. Your program truly brightened my day. I look forward to receiving more cards from Card Care Connection." "My mother recently received a beautiful handmade card from your program. It made her feel special and added a bit of sunshine to her day! Thank you for everything you do! She is very weak and the only people she sees is when she goes to the grocery store. This is such a nice gesture and so glad there are programs out there such as this. Hugs to you and your card makers." “The Women are very supportive and happy to partner with you in providing cards for people experiencing the diagnosis, treatment, symptoms and trauma of cancer. We hope your recipients enjoy the hand crafted cards." "As a cancer survivor myself, I am very happy to share another set of cards for your program. I hope that my time and creative energy will bring joy to the people you serve! Hugs to you." "It is our pleasure to bring joy and encouragement to those who are facing uncertain times. Our thoughts, prayers, and love go out with every box of cards. Thank you to Card Care Connection for taking the initiative to touch the lives of people with cancer." "We enjoy sharing our creative gifts and feel blessed to know that our cards will help lift people's spirits who are living with cancer." "It is exciting to know there is an organization like Card Care Connection that is able to provide uplifting cards to patients dealing with cancer. These cards let our patients know they are not alone and the community is thinking about them." "Thank you so much. We all appreciate these beautiful cards. The patients and families really enjoy them."